After 4 toasts and 3 eggs I have to say goodbye to Matt and his lovely family and hit the road once again shortly after 8. They were unbelievably great trail angels and I feel a bit guilty that I can't really give something back. Leaving at 8 means to arrive at Okura River 2 hours before low tide. An hour too early. But better early than too late. Lots of showers in the vicinity and it's just a matter of time until I walk into one. It happens close to Stillwater. A light shower turns into a heavy one. Luckily I find a shelter in a bus stop "cabin" just before the port and wait for the shower to pass. The problem: it just won't pass. The shower turns into rain and after 20 minutes, I decide to carry on anyway. 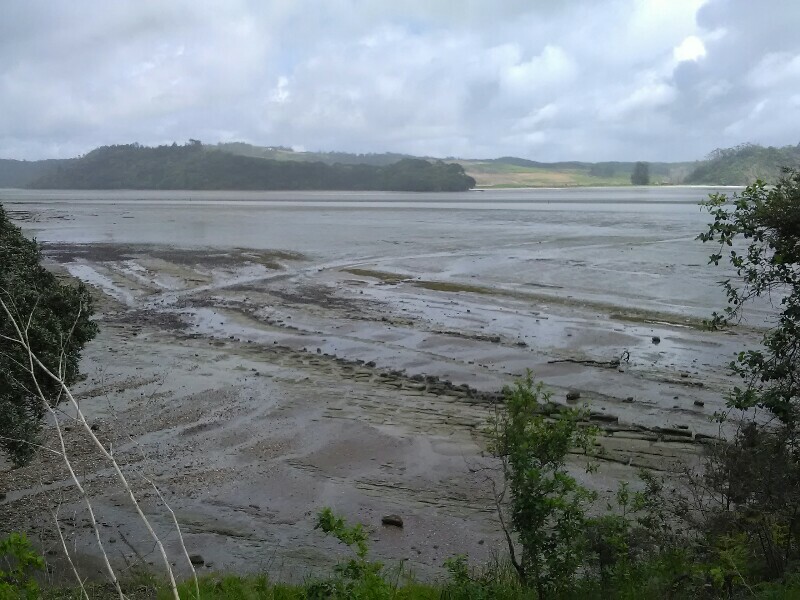 The trail leads initially through a flooded swamps than onto the sand around cliffs to a cottage close to the Okura River. Soaked and freezing due to the chilly wind, I make another rest in front of the locked cottage, hoping the river won't be flooded. My mood at this point: sub-zero! With the adrenaline kicking in a little, I even don't really realize the cold. With all my clothes back on, I continue through Long Bay Park, already soaked again thanks to the next shower. The massive cumulonimbus clouds are moving away quickly and by the time I leave the park, it's actually looking very pleasant, no more rain insight! From now on it's another 30km along the coast. Signs roughly guide the way but I rather rely on my GPS. An interesting, easygoing mix of walkways right in front of villas, crowded beaches, road walk with a bit of rock hopping thrown in. The Sky Tower, initially terribly far away, coming closer and closer. With the setting sun, going gets harder. Especially the up and down when you need circumnavigate the cliffs via walkways and roads is really tiring. 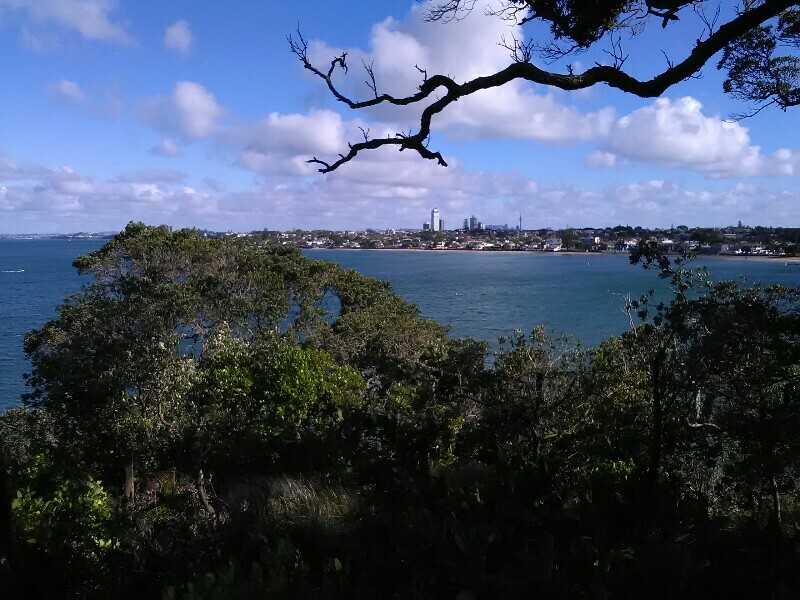 One last steep climb up to an old Fort offers great views of Downtown Auckland. Wow! Now all that is left is only the descent towards the pier, the ferry ride across and a few steps to my hostel. 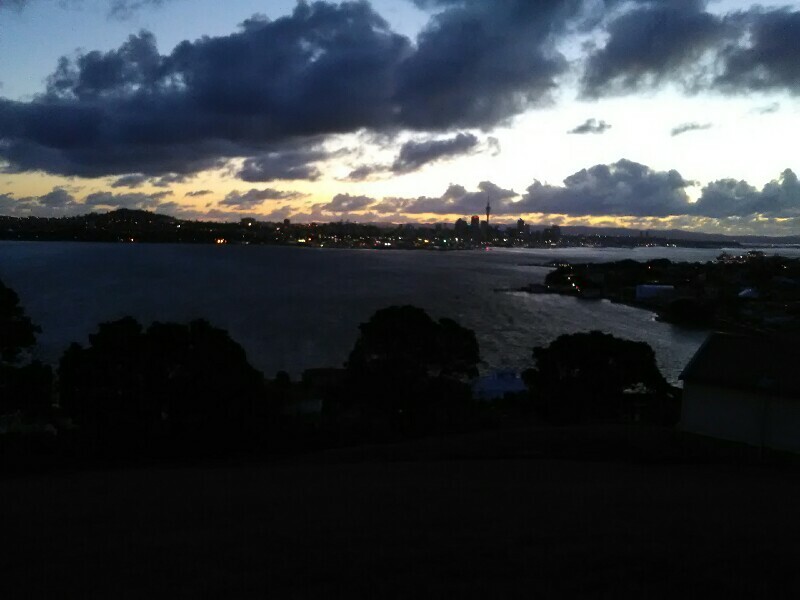 So happy I made it until Auckland. 24 days on the trail, nearly 600km (official TA) or 1/5 of the 3000 km hiked. Hi Sandro. That was a long day, congratulation for reaching Auckland. You certainly have earnd a break. I'm looking forward when you are countinuing your walk very much. Good luck and take care.